Well I'm expecting the critique of my novel back mid May and then I'll be pressing on with finishing it so I maybe around a little randomly. (Unless it's totally panned where I will then be around more frequently while it forms a nice funeral pyre in the back garden.) However, for the moment I thought I'd use the time to catch up with all the posts I'm owing. 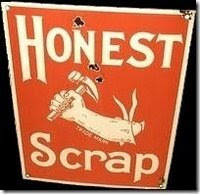 So I'm going to start with The Honest Scrap Award which my dear friend Marie over at Nourish gave to me back in early February. Now it took Marie three months to accept her award before passing it on.... so what can I say... but don't feel bad Marie three months looks like the standard now! "Eat your mashed potato before go out to play!" "Tidy up now, I want to see this room spick and span before you go out to play!" "Have you done your homework? No? 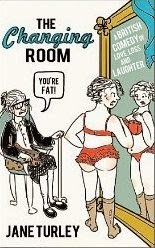 Right do it now before you go out to play!" Blimey, teachers are just killjoys aren't they? When are they going to understand that school is about playing? Education....that's just an incidental. So what am I trying to say here? Umm... I have a problem with authority! Yep, I would have been crap in the army. I'd have been arguing all the time with every instruction and complaining about my chocolate rations. In my defence I think arguing can be a useful asset-even in the army - for example I'd probably have argued with Field Marshall Haig "The Butcher of the Somme" during the First World War about his military tactics which could have been a positive. Of course, the downside of this is that I might have been shot for treason but hey at least I'd have got a last request!
" Double portion of Chocolate Devil's Cake please and tell Haig he's a ****** will you?" Gordon, Gordon, where for art thou Gordon? I knowest thou has mucked up the economy big time but I can forgive thee if thou comest to my bed chamber quickly. For I have tasted the vileness of poisoned chocolate and will soon fall into a deep eternal sleep unless your sweet lips do bring me back to life. Ps. Don't forget to bring your dagger and stab yourself. 5. I am not in love with Catherine Zeta Jones. I have never, ever thought about her and her stunning good looks and curvaceous body. And she is soooo gorgeous and talented I'm sure the fact that Michael Douglas is hideously rich and knew everyone in Hollywood had absolutely nothing to do with her trapping him. I mean "marrying him. ".You see nice girls don't marry for money - I didn't. Boy, have I made some mistakes. 6. Oh well back to my desk again....just for the heck of it. Currently I have 5 cups, 1 glass, 1 bottle of Apple and Raspberry Slightly Sparkling Spring Water Drink,(Glad they clarified the "water" bit - I was worried for a moment), a small bottle of Lucozade (For the sugar high) and an empty can of Diet Coke. I also have an empty bottle of Diet Pepsi on the printer. Now you've got to admit that is a "crap" fact isn't it? 10/10 for crapness? However, it may explain why I have an embarrassing problem when I sneeze. 7.When I was at Whipsnade Zoo I bought a little reusable bag. It's about 10 x 8, green and has printed on it "My Little Green Bag." Wouldn't it have been funnier if the bag had been pink? 8. I have written to David Cameron, the Tory Leader, and said that I am prepared to support him in the next election if he promises to introduce compulsory facial hair checks for women over forty. I think he'll get a lot of female (and possibly male) supporters. 9. It's a bank holiday Monday here which means the kids are at home. -We are NOT going to Whipsnade zoo - I received a letter of thanks. Apparently some ape hanged himself after our last visit. His suicide note said he was worried about evolving into a human. 10. All of this blog is a complete fabrication. My name is actually Gordwina Brown, I live in an institution for retired actresses in the seaside resort of Hastings. Most days I sit in my bath chair listening to recordings of Michael Jackson singing "We'll Meet Again - If Only I Knew Who I Was." HA, too late. Already got lumbered... hum, honoured with the award, so you'll have to find some other mug... erm, deserving recipient. I'll get back to you on this! ALL girls marry for money??? Where Oh where did I go wrong?? Hmm... well I shall have to have a longer look at your doggy tales and find this Honest (S)crap award. You sound as if you know a lot about the subject! You're sounding eager to do this! Now try to think positive - think about all those interesting little details of your life that people would love to know about you - then discard them and write a load of crap. Worked a treat for me - once I started it took me no time at all! Wow, so much honesty! I think you need it all over again . So I confer the most honest crap ever award on Gordwina Brown. I bet her honest confessions are going to be equally interesting once she has figured out her name is actually jane turley!